Batchelors Way: How was your Halloween? Ours was Great! How was your Halloween? Ours was Great! I know I promised a post about my light fixture and it is coming, but this just couldn't wait. only the older audience will remember the original movie of the Karate Kid. We have this movie, so Branden decided that's who he wanted to be. 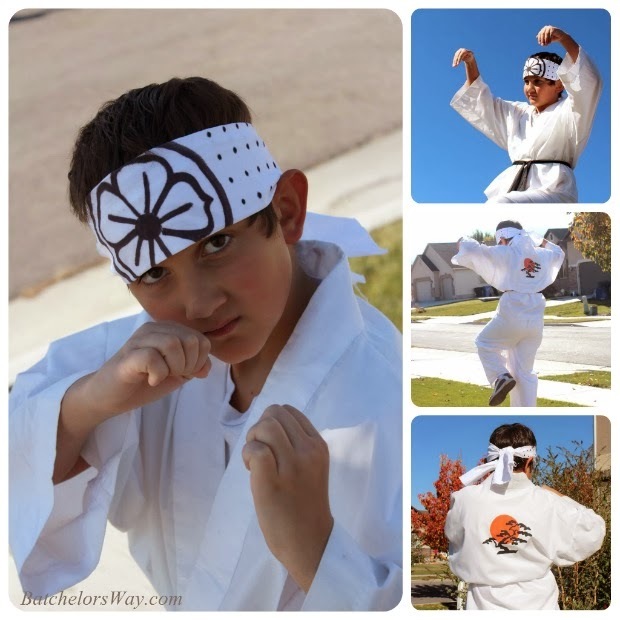 We have the costume down to the detail of the painting on the back of his gi and his headband. This costume I originally made for Jaysen, so easy peasy for me this time and zero dollars. If you remember the movie you recognize the Crane move Branden is doing in his pictures!!! Gosh I love this kid! 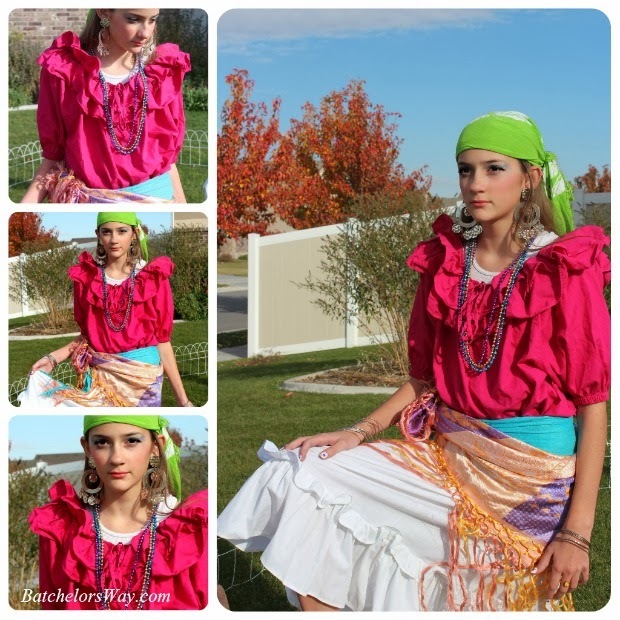 If you want your fortune read I know a beautiful gypsy! I have no idea where Ashlee came up with this idea, but it turned out great and she had so much fun! I can't believe how pretty she looks even with all that gaudy jewelry and make-up. We pieced her costume together with stuff we had in our costume closet. 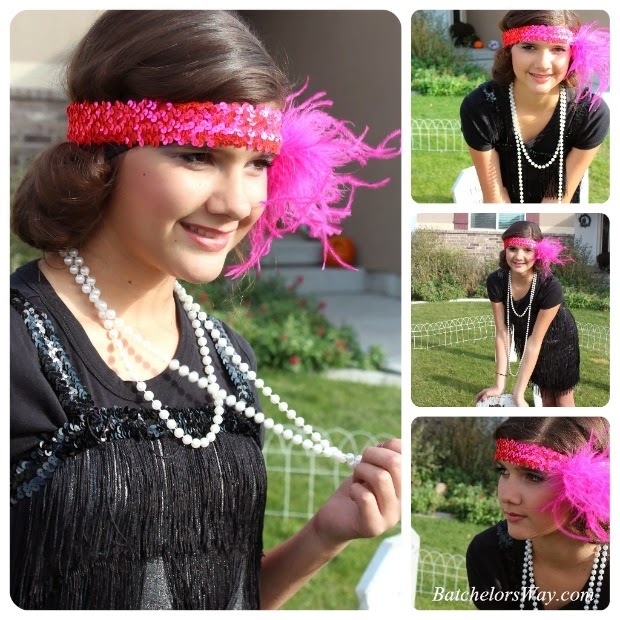 And my cutie Emilee chose to be a Roaring 20's Flapper! She picked her costume when we found the dress at a second hand shop while back to school shopping. The dress cost $4, we borrowed the pearls from Nana, and I made the headband from stretchy sequin trim I had left over from something and bought the pink feather for a couple of bucks. I also purchased flesh colored tights for $5 which I thought she could wear later. $11 total for Emilee's costume. She looks way too cute!! Total I spent on costumes this year was $11 dollars for three costumes!!! I will be back soon with the light fixture!!! Great costumes! I love the girls costumes! Branden looks just like the Karate Kid. I was very thrifty with my kids costumes this year too!